In the modern day, pave has become nearly the standard method of setting diamonds onto metal in jewelry. Pavé, (pronounced pah-veh) is a french word that means “pavement” as in a cobblestone paved street. Pave in jewelry is very beautiful because very little metal is visible especially in certain styles of pave. There are a myriad of pave styles to choose from, some flavors resemble one another while others create a drastically different look to a design. To begin, clarification is needed between pavé and micro pavé. The term “micro pavé” in the past used to be reserved for pave work using very small melee of approximately half a point or 0.005ct or smaller which necessitated the use of a microscope. Working with stones of this size or smaller without magnification would have been produced sloppy work or would have been impossible to accomplish. A microscope provides a highly magnified image of the work surface. The level of magnification offered by a microscope allows a craftsman to be extremely precise with his work. Over time craftsmen realized the huge advantages of using a microscope with even larger sized diamond melee. The huge downside of micro pave is the damage to a craftsman’s vision over extended periods of use. It’s common for a micro pave diamond setter to have a career lasting only 5-10 years before being unable to work with a microscope. The highest quality pave work today is always done with the aid of a microscope. Victor Canera’s pave jewelry can be called “micro pave” because it is strictly done with the use of a microscope. Bright Cut Pave is considered the most traditional type of pave since it is one of the oldest forms of setting round melee. Bright Cut pave is sometimes called “channel set pave” because the diamonds seem to be set in the middle of two walls of metal. We’ve also heard the term “bead set” being used for bright cut pave as well. Bright cut pave has had a resurgence in the past couple of years due to the increased interest in vintage jewelry. Modern forms of pave such as u-cut or french cut pave was in vogue because of the absolute minimal amount of metal visible with these pave styles. Bright cut pave has a slightly higher ratio of metal to melee compared to these modern pave styles from the distinctive "bright cut" metal walls framing the melee. These walls increase the durability of jewelry though by not exposing the girdle (sides) of the melee and protecting the stones in between the walls against inadvertent damage. Bright cut pave begins with choosing the appropriate sized diamonds for a metal surface and dividing the metal surface evenly using a divider to mark the points where the melee will eventually be set and scribing the metal with a scriber. The process then proceeds into the drilling of holes on the metal surface using drill bits and metal burrs. The metal around the melee is carefully carved with the help of a sharp “graver” basically chiseling the metal into “beads” or prongs that hold down the melee. The beads are then shaped using a “beading tool” that perfectly shapes the prongs or beads into hemispherical balls. The final step involves the creating of the “bright cut” walls using a sharp “graver” tool made of carbide or hardened steel. These walls are indented into the metal which creates the relief of the prongs holding the stones. The walls framing the beads are what actually give the name to this style of pave. The name Bright cut refers to the walls that are “cut” with the use of sharp “graver” tools creating highly polished walls that produces a very reflective surface. These “bright-cut” walls reflect light into the melee diamonds. There can be slight differences within the bright cut pave style as well. One difference can be in the number of prongs or beads holding a single melee stone. Bright cut can be done using four beads or two beads per melee stone. The difference between four prong and two prong bright cut is subtle and might not be noticed unless a person was to inspect the pave using magnification. The two bead version of bright cut pave is exactly that, two beads holding a single stone located on two corners. The four bead version has four beads securing a stone located on the four corners of an individual melee stone. Each sub-style of bright-cut pave can have minimal metal separating individual melee stones. Bright cut pave, unlike other forms of pave, has the stylistic advantage of being able to add millgrain (sometimes spelled milgrain or millegrain). Millgrain is the process of adding graining to the walls of bright cut pave. This graining is added with the help of a micro tool very similar to a pizza cutter. The millgrain beads can be adjusted from coarse to very fine using different attachments to the millgraining tool. Millgraining adds a beautiful vintage or antique feel to pave, especially fitting in a vintage jewelry design. In other instances just the added touch of millgraining may make the pave look more complete. Bright cut pave without millgrain results in a “cleaner” and more more modern aesthetic. Bright cut pave can additionally be done in rows or at angles from each other. This can be called multi row bright cut pave. 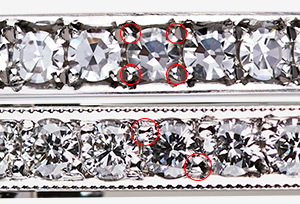 The most common form of multi-row bright cut pave is seen on bands of ring that have three rows of pave on them. The top most surface of the band is set with melee and the sides of the band at typically a perpendicular angle to the first is also set with diamond melee. The exact angles can be adjusted to taste. There is actually no limitation as to how many rows of pave that can be done on a surface of metal as long as there is enough surface area. 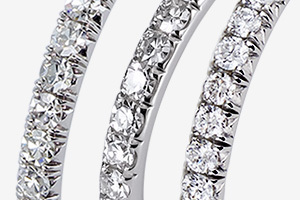 Other popular ring styles such as “knife edge” bands or shanks can be set with two rows of bright cut pave that are at sharp angles the cut out of which would resemble the shape of an inverted “V”. Bright cut pave has made a resurgence in the past couple of years because it is a traditional form of pave which matches vintage inspired jewelry designs that have become very popular lately. Modern pave techniques came about through advancements in gem cutting that allowed precisely cut melee at small sizes, the general use of microscopy in diamond setting and the demand by designers and consumers to minimize the amount of visible metal above and beyond traditional pave. These advancements allowed modern forms of pave to come to the forefront in modern day pave diamond setting. Modern forms of pave such u-cut pave, v-cut pave, french-cut, (also called craponia or fish tail pave) and our own neo-french are typically set on rounded rather than flat surfaces. This produces the allusion of the diamonds floating, with the metal steeply rounding off away from the melee. Additionally, the lack of the bright cut walls found in traditional pave allows for larger melee to be set. These two points taken together produces the minimal metal look that modern pave is known for. Modern pave styles are typically done with melee that are smaller than 1.6mm in diameter. 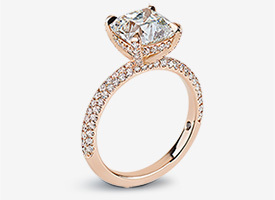 Although technically larger size melee can be used, most designers would prefer to use traditional bright cut pave or other forms of diamond setting for these larger sizes. The best results in modern pave are achieved when very consistent and precise melee are used. Typically consistency of 0.02mm in melee are required in order to achieve the best results. As an example, if a metal surfaces requires melee of 1.10mm, stones measuring smaller than 1.08mm and larger than 1.12mm are not used in order to achieve that almost machine made quality in modern pave. Consistent sizing of the melee also allows for tighter and even spacing between each and every stone. One of the most popular forms of modern pave is u-cut pave. The title of this style of pave comes from the U shaped grooves visible from the profile of the pave. Similar to other forms of modern pave, u-cut features a high percentage of melee to metal maximizing the amount visible diamond producing that minimal metal appearance. Victor Canera offers two variations of u-cut pave which we term “shallow u-cut pave” and “deep u-cut pave”. With deep u-cut, a craftsman’s burr creates the u-grooves by perpendicularly burring the metal to a relatively deep depth. With shallow u-cut, a spherical burr is used and much less metal is taken out of the metal surface. Deep u-cut exposes a large portion of the side profile of a stone whereas with shallow u-cut only a small portion of the girdle of the melee is exposed. Shallow u-cut is therefore more durable because less of the side of a stone is exposed decreasing the likelihood of inadvertent damage. Shallow u-cut pave is also more durable because less metal is taken out of a piece of jewelry which helps it to retain more strength. Within this modern pave family is French Pave sometimes coined Craponia or “Fish Tail Pave”. This type of pave also features the minimal metal look like the other modern pave styles. French pave can be described as having a more angular or “geary” appearance due to the additional bright cut facets that resemble a “w” shape as seen from the profile. French Pave and Neo French Pave gray the lines between engraving work and diamond setting. In fact the finest French Pave is typically done with the aid of an engraving motor that adds vibration to a sharp “graver” that allows a diamond setter to basically engrave the facets on the metal. A style of pave that is exclusive found at VictorCanera.com is Neo-French pave. This style of pave bridges the gap between u-cut and french pave. Neo-French begins very much like u-cut pave but adds additional etching along the side metal walls. The additional work involves the etching of the metal underneath individual melee that serves to delineate the prongs holding the stones much more. This style almost resembles prong setting because of this addition. Neo-French has a more vintage feel to it that seems to suit antique inspired designs especially well. Additionally, Neo-French Pave eliminates the “geary” angularity of French Pave. These modern forms of pave can also be set in multi-row arrangements whether it be 2,3,4 or 5 rows of pave. Modern, multi row pave produces a spectacular aesthetic that from a distance resembles a diamond encrusted piece of fabric. Multi row pave in and of itself is a delicate form of diamond setting because of the exact characteristics that make it beautiful; diamonds set extremely tight together, with almost no visible metal.